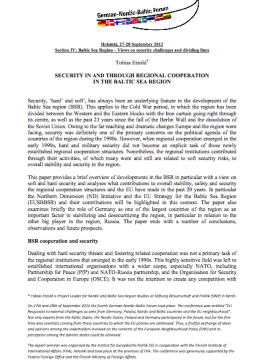 Security, ‘hard’ and soft’, has always been an underlying feature in the development of the Baltic Sea region (BSR). This applies to the Cold War period, in which the region has been divided between the Western and the Eastern blocks with the Iron curtain going right through its centre, as well as the past 23 years since the fall of the Berlin Wall and the dissolution of the Soviet Union. Owing to the far reaching and dramatic changes Europe and the region were facing, security was definitely one of the primary concerns on the political agenda of the countries of the region during the 1990s. However, when regional cooperation emerged in the early 1990s, hard and military security did not become an explicit task of those newly established regional cooperation structures. Nonetheless, the regional institutions contributed through their activities, of which many were and still are related to soft security risks, to overall stability and security in the region.